The book guides you trough changes including the new interface, articles, menus, access control levels (ACL), templates, extensions and SEO features. 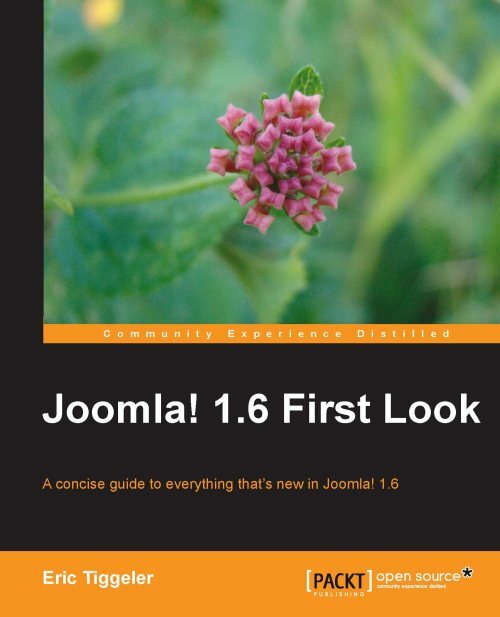 This book is written for users, developers and designers who are familiar with Joomla 1.5 and want to know what’s new in Joomla 1.6. Packt has asked me if I’m interested in reviewing this book by the famous Dutch Joomla expert Eric Tiggeler. This month im going to review another book; Joomla! 1.5 Top Extensions Cookbook by Packt Publishing. The review will be published on this site, like always. The Joomla! 1.5 Top Extensions Cookbook is one of Packt Publishing’s cookbook series meaning that it contains recipes. This book contains over 80 different recipes to use extensions to add maps, image galleries, slideshows, audio and video players, security, forums, shopping cart, guestbook and other functionalities to your site. Each recipe is a small articles/paragraphs with an idea and how to work it out, just like a regular cookbook. Your now reading my Joomla! 1.5 Cookbook review. The book was released in October this year. The Joomla cookbook is one of Packt Publishing’s cookbook series meaning that it contains recipes. 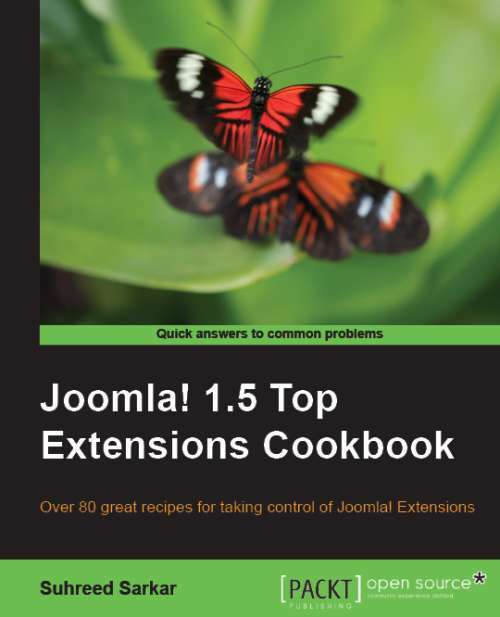 This book contains over 60 different recipes to execute basic and advances Joomla queries. Each recipe is a small articles/paragraphs with an idea and how to work it out. Just like a regular cookbook. I have been offered the chance to review this book by Packt Publishing Open Source. The book is about Joomla! 1.5. Joomla is an open-source award-winning PHP/MySQL based content management system (CMS). Since its available under the GPL license it`s free to download, modify and use it for your website. The book contains guides how to manage your Joomla site easily and conquer difficult situations. It`s written for beginning and advanced Joomla users, with or without experience with CMS systems and webdesign (HTML) knowledge. The first chapter of the book contains guides how to install Joomla 1.5.x using two widely used methods (cPanel and GoDaddy). It teaches how to upload, set file permissions and create a database using phpMyAdmin. The second chapter dives deeper into phpMyAdmin`s functionality. It teaches you how to export (backup) and import (recover) databases. It also explains the basics of the MySQL database like how to view, modify and delete a table. Chapter three explains how to install, manage and choose a Joomla! template. The chapter also mentions some sites where you can find (free) Joomla templates. Also inside the chapter is how to attach a template to a certain section of your website. Another recipe explains how to chance the template`s logo to yours. If you want to know more about Joomla! templates have a look at Joomla! 1.5 Templates Cookbook. Next chapter (four) is about content and menu`s. The chapter starts with changing the default WYSIWYG editor. Next is managing sections and categories. Following these recipes is the article creation and management part. Next up are the menu`s (no I’m not talking about food, although it are recipes!). Further this chapter tells you how to setup your Joomla site as a blog and how to create menu`s for extensions. The fifth chapter is all about managing links, users and media (pictures, video, audio). It starts with explaining how the user management part works. This includes the creation, modification, deleting and blocking users. Of course it also explains how to use user groups. Next recipes are about media management and uploading and using the link manager. The final recipe in this chapter is how to recover a lost super administration password. Chapter six is about components, extensions and modules. It starts with the basics of modules; what they do, the difference between them and how to install/delete/manage them. The seventh chapter explains the K2 Content Construction Kit. The K2 CCK is a nifty tool for managing websites with loads of content. First steps are the installation and configuration of this extension. Next recipes explain the use of this extension. Further in this chapter are extensions for the K2 CCK, modules like the tag cloud and comments are explained. The following chapter (eight) teaches how to use several handy third-party extensions like a file manager, calendar, content uploader and an improved comment system. This book also contains an important guide how to troubleshoot website problems. This is done in chapter nine. It starts with making a plan for troubleshooting and debugging. Next are repairing database related problems and extension related problems. Following these parts are the FTP and SSH problems. Security of your site is chapter tens content. Recipes include setting permissions, patching Joomla, blocking known bots and IPs by using a .htaccess file, blocking directory viewing, adding an error page, blocking the servers banner and changing php.ini for security reasons. The final chapter of this book (number eleven) is about the future version of Joomla, 1.6. it starts with the Access Control List followed by working with the new category manager and it ends with the new extension manager. The book promises that it will give solutions to all basic and advanced queries you could encounter while running a Joomla! Website. I have the idea it did. It teaches you how to make content, sort it, use several plugins, make backups and explains all features you should use if you run a Joomla! site. What I liked about this book was that there was a picture every step. Therefore it`s difficult do make a fault with each step. I can recommend this book for everyone who wants to learn the basics of Joomla. What would I do to improve the book? I can`t think of anything right now. If your curios after reading this review, you can find a sample chapter here.